The US will use all economic and political tools at its disposal to hold Venezuelan President Nicolas Maduro accountable for his country's crisis and will make clear to Cuba and Russia they will pay a price for supporting him, US Secretary of State Mike Pompeo has said. Mr Pompeo made the comments in the Colombian border city of Cucuta, the final stop of a three-day trip to Chile, Paraguay and Peru, a clutch of fast-growing countries in a region where Washington's concerns are focused on the Venezuelan crisis and China's growing presence. President Maduro blames US sanctions for the country's economic problems and dismisses opposition leader Juan Guaido - who in January invoked the constitution to assume an interim presidency - as a US puppet. More than three million Venezuelans have fled hyperinflation, food and medicine shortages and political crisis. 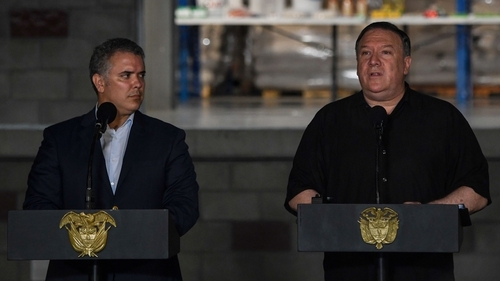 "The United States will continue to utilise every economic and political means at our disposal to help the Venezuelan people," Mr Pompeo said after visiting migrants at a Cucuta shelter and touring border bridges and a warehouse storing humanitarian aid. Although most Western nations, including the US, have recognised Juan Guaido as interim head of state, Russia, China and Cuba have stood by Nicolas Maduro. "You watch the political and diplomatic noose tighten around Maduro's neck," Mr Pompeo told reporters accompanying him on the trip before taking off for the United States. "Cubans must understand too that there will be cost associated with continued support of Nicolas Maduro," he said. "And we’re going to have that same conversation with the Russians as well." Washington has imposed a raft of sanctions against President Maduro's government in an attempt to dislodge him from power, but he retains the backing of the country's military. On Friday, the US Treasury Department added four firms and nine ships to its blacklist, some of which it said carried oil to Cuba. While no final decision has been made on punitive measures Mr Bolton is expected to announce, the Trump administration has been considering a range of options, including new targeted sanctions and further tightening of business restrictions on the Communist-ruled island that had been eased by former President Barack Obama, according to two people familiar with the matter. Mike Pompeo urged Nicolas Maduro to leave his post and Venezuela so the country can return to normalcy. "I hope that you will care now, when you see the horror, when you see the tragedy, to change your ways and to leave your country," Mr Pompeo said. During his trip, the US Secretary of State echoed his government’s previous criticism of China's growing presence in Latin America, warning of "predatory" lending practices and "malign or nefarious" actions.